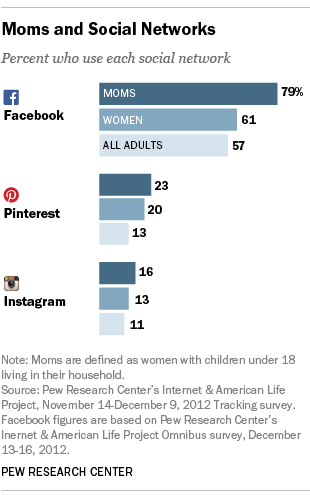 Perhaps it’s not surprising so many moms are on Facebook. 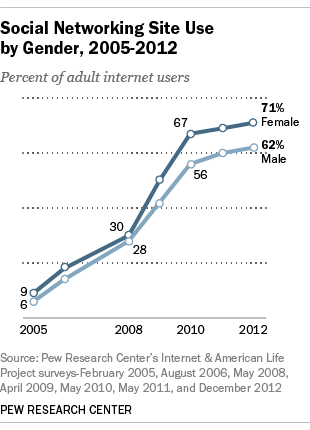 Women surpassed men in their social networking site usage several years ago and since then they have been consistently more likely than men to use online social networks. Of course, more moms (and dads) on social networking sites means they must navigate relationships with their children, who may also be online. Among all parents who have a child between the ages of 12-17, 66% now use a social networking site of some kind, up from 58% in 2011. Previous research from the Pew Internet & American Life Project has shown that teens have mixed feelings about being friends with their parents on Facebook. Even so, the vast majority of parents and teens friend each other. In 2011, 80% of parent social media users whose children were also users of social media have friended their child on the sites. So if you do reach out to Mom on Facebook, statistically speaking, there’s a good chance she’ll be watching her newsfeed — and yours.